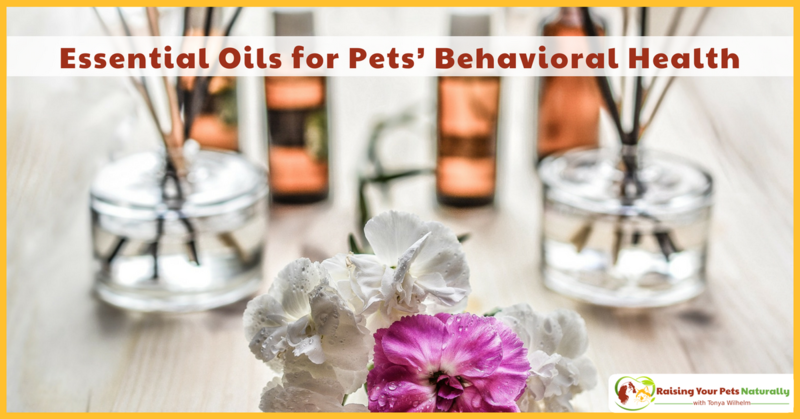 Today is part three of a series with Isla Fishburn, Ph.D.: Essential Oils for Pet’s Behavioral Health. It is important to read Part One, the Basics of Essential Oils and Pets, before jumping in below. Now, this is the topic that I have a vested interest in. 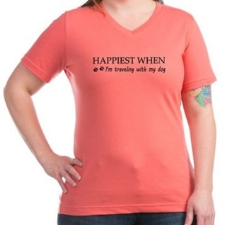 I’ve spent the last two decades working with clients and their pets’ behavioral issues, particularly canine anxiety. Roman Chamomile (Anthemis nobilis). This oil provides a calming action for pets that are suffering from anxious or nervous behaviors, or for those animals who are consumed with worry. This oil can be inhaled, ingested or applied topically on your dog (only if your dog selects its use); inhalation only for cats. Hops (Humulus lupulus). Hops can be an effective oil to help calm an animal who is anxious, nervous, or where irritability might be seen in your pet. This oil can be inhaled, ingested or applied topically on your dog (only if your dog selects its use); inhalation only for cats. Valerian root (Valeriana officinalis). Valerian root is a relaxant and mild sedative. 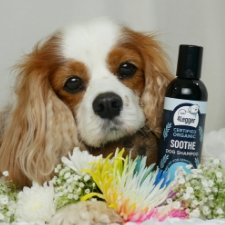 It offers calming and soothing support for your pet where there is anxiety, panic or tension. Nutmeg (Myristica fragrans). Nutmeg can help to ground an animal who is anxious, hyperactive and where their energy is scattered. This oil can be inhaled, ingested or applied topically on your dog (only if your dog selects its use); inhalation only for cats. Lavender (Lavandula angustifolia). Amongst it several uses, lavender can be used to soothe and comfort an animal who is suffering from distress and/or anxiety. This oil can be inhaled, ingested or applied topically on your dog (only if your dog selects its use); inhalation only for cats. Frankincense (Boswellia carterii). On its own, or with the support of other essential oils that help reduce emotions of fear in an animal, Frankincense can help distance an animal where there are stress and commotion. It can support a pet who is showing fear, on many levels and where a dog may be breathing heavily as a result of fear related issues. This oil can be inhaled, ingested or applied topically on your dog (only if your dog selects its use); inhalation only for cats. Violet Leaf (Viola odorata). If an animal is shocked or showing hesitancy/wariness then violet leaf can support an animal who is expecting to see, hear, smell or be exposed to a bad experience. 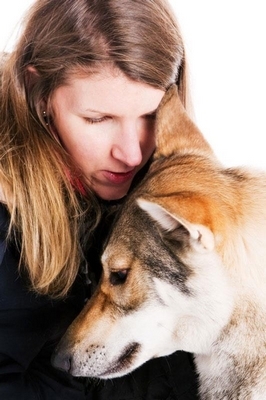 It can support an animal who is nervous and provides comfort and reassurance. This oil can be inhaled, ingested or applied topically on your dog (only if your dog selects its use); inhalation only for cats. Linden Blossom (Tilia cordata). On its own, or with the support of other essential oils that can help a fearful animal, Linden blossom can provide a sense of feeling of trust and safety. It can support an animal who is fearful and who has suffered abuse. This oil can be inhaled, ingested or applied topically on your dog (only if your dog selects its use); inhalation only for cats. Sandalwood (Santalum austrocaledonicum). As well as providing support at a physical level, Sandalwood can support animals who also have emotional imbalances, particularly where there is worry and uncertainty. It can be very effective on its own, or in combination with other essential oils. This oil can be inhaled, ingested or applied topically on your dog (only if your dog selects its use); inhalation only for cats. Rose Otto (Rosa damascena). Rose Otto provides deep emotional support for animals that have been subject to suffering, trauma and/or neglect. It can sometimes be used to remove unwanted aggression that the animal displays. Rose Otto can often be a difficult essential oil for an abused, neglected or terrified animal to work with and it also comes with a caution; an animal may release unwanted negative behaviors when using Rose Otto, meaning an animal may react negatively and aggressively before positive results are seen. This oil can be inhaled, ingested or applied topically on your dog (only if your dog selects its use); inhalation only for cats. Vetiver (Chrysopogon zizanioides). Vetiver provides comfort and reassurance for an anxious pet who may show aggression or where an animal is showing aggression through assertive behaviors towards another individual. This oil can be inhaled, ingested or applied topically on your dog (only if your dog selects its use); inhalation only for cats. Vanilla (Vanilla planifolia). This essential oil has comforting and nurturing qualities for an animal that has nervous tension or where the animal is displaying irritability and anger. Animals that have been known to bite can often use it or try and bite when they become irritated or angry. This oil can be inhaled, ingested or applied topically on your dog (only if your dog selects its use); inhalation only for cats. Clary sage (Salvia sclarea). Often used for female animals, it can also be used for males that show anger, mood swings, and frustration. It provides relaxing, calming and soothing effects. This oil can be inhaled, ingested or applied topically on your dog (only if your dog selects its use); inhalation only for cats. Yarrow (Achillea millefolium). Along with its ability to heal physical imbalances, yarrow can work on its own or in combination with other oils to support an animal who has emotional imbalances through being over-sensitive or being at the hands of neglect and abuse. This oil can be inhaled, ingested or applied topically on your dog (only if your dog selects its use); inhalation only for cats. Neroli (Citrus aurantium). On its own or along side Mimosa, this can often be a difficult essential oil for an animal to accept. It can offer support for an animal who is suffering with depression or has deep loss, sadness or loneliness. This oil can be inhaled, ingested or applied topically on your dog (only if your dog selects its use); inhalation only for cats. Mimosa (Acacia decurrens). On its own or along side Neroli, Mimosa offers feelings of comfort and support where an animal has been subject to loss and/or separation. Peppermint (Mentha piperita). This oil can be inhaled, ingested or applied topically on your dog (only if your dog selects its use); inhalation only for cats. 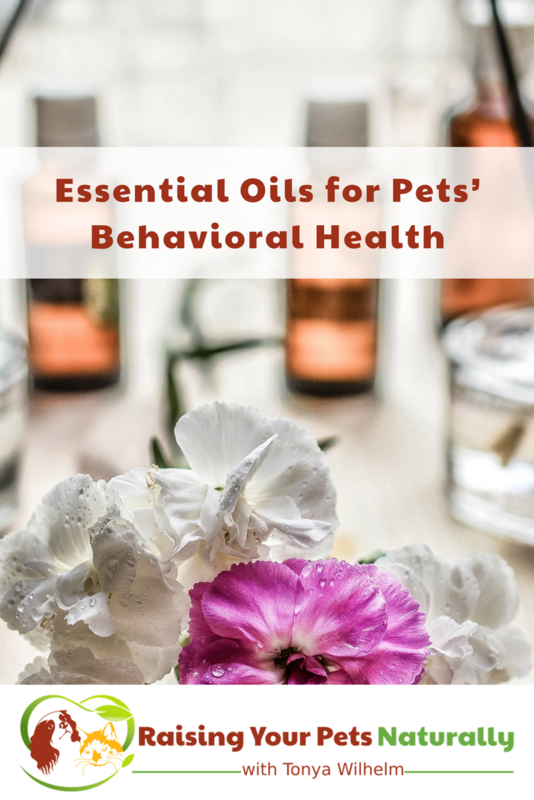 With the help of Isla Fishburn, various books on essential oils and pets, and the online workshops I attended, I am much more confident in recommending the use of essential oils and pets, particularly for behavioral issues. But my education on essential oils and pets does not stop here. 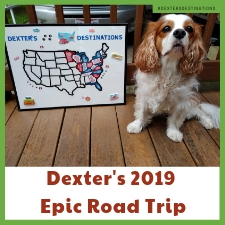 I will continue to learn what I can about their uses and their precautions, and I urge you to do the same if you are interested in learning more about essential oils and dogs and cats. Thank you for joining me in this three-part series. Isla Fishburn Ph.D. is a canine wellness practitioner who owns Kachina Canine Communication in Northumberland, United Kingdom. 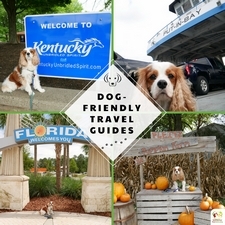 As a canine wellness practitioner, Isla focuses on the physical, emotional and spiritual needs of a dog and how to support your dog in returning him/her back to balance. Isla works with both captive wolves and domestic dogs and teaches canine wellness and balanced behavior courses, consults for a raw food company in the UK and uses a range of holistic therapies to support a dog’s wellness. Isla has a BSc in Zoology and a Masters and PhD in Conservation Biology. She is also a caninepharmacognosy practitioner, offering a range of essential oils to canines to balance their vibrational states and return the animal back to normal functioning. 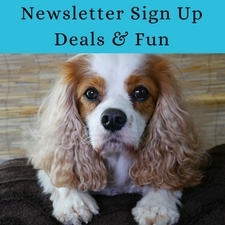 Have you used essential oils with your pets? Tell me in the comments. What would I use for a 9 year old cat who poops on newspaper or pet pads and urinates on any cloth, clothes, etc that are left on the floor? She is healthy, just misunderstood! To avoid fleas, I usually bathe my dogs in coconut oil. My little chihuahua was scratching so I told my son to check him out and I was surprised, yup he had about a dozen of fleas. So we used a little coconut oil (hexane free) and Dr.Woods Castile soap with cedarwood oil (which is good for either cats and dogs). After that I washed him off then dried him and rubbed him all over with coconut oil. He even licked a little bit of coconut oil and enjoyed it. However, he is fine now, very happy and clean as a whistle. So glad you cleared him up. Old but great article. Keep it up!